Welcome to our Eleventh Anniversary Issue with special thanks to our readers and advertisers, all of the galleries, museums, artists and publicists we have worked with and, especially, our devoted writers whose hard work has filled our pages. It would be an understatement to say the past few months have been an emotional rollercoaster for those living in the United States, and this has seemed especially true for its artists. Some are addressing their emotions directly through artworks whose message needs no interpretation; others need the solitude now, more than ever, of a canvas or large installation piece to escape the everyday discourse. This issue opens with a special pair of “Cornered” interviews conducted by Lanoue Gallery’s Gina Fraone with Syrian-born Mohamad Hafez, who addresses the recent tragedies suffered in his homeland through his artwork, and Congressman Seth Moulton, whose office is sponsoring the showing of Hafez’s work at Lanoue as well as the Christopher Brodigan Gallery at Groton School. Fraone’s piece is complemented by Greg Morell’s profile of Harriet Diamond, whose “Driven from Their Homes” sculptures are intended to capture the feeling of being a refugee forced to escape their home country with what few possessions they can take; they’re are on view this March at Northampton’s Oxbow Gallery. South Korea-born Dartmouth professor Soo Sunny Park has been establishing a name for herself both nationally and internationally, with recent shows at New Britain Museum of American Art and the Sharjah Art Museum in the United Arab Emirates; Donna Dodson puts the spotlight on her “BioLath” exhibition on view through August 6 at the Currier Museum of Art in Manchester, New Hampshire, which promises to be one of the highlights of the region’s 2017 schedule. Nancy Nesvet traveled to Galerie Lelong in New York City to interview Krzysztof Wodiczko, director of the School of Planning and Architecture at Harvard University, about his career and working with his Harvard students. Wodiczko’s installations have played an important role in speaking out against injustice here and around the world. Molly Hamill visited Endicott College to review an exhibition of photographs by faculty members Maria Cusumano and Mark Towner taken during a recent trip to India. The bright colors of “Om Tat Sat: Reflections from Mumbai to Kolkata” will warm up your late winter day and also provide insight into the minds of two artists documenting a vacation while pondering its place as art. It’s one of a number of juried shows featured in this issue; James Foritano took in the Cambridge Art Association Members Prize Show and I previewed the captivating “Wheaton Biennial: Printmaking Reimagined” exhibition being held at Wheaton College in Norton, Mass. Another part of the national discussion, gun ownership, is the focus of “Unloaded,” a nationally traveling show arriving at The Institute of Contemporary Art at Maine College of Art this spring; J. Fatima Martins, in previewing the show, notes that it’s a serious exhibition. “It is not a show that one takes in for pure pleasure.” It certainly addresses the question of what role can art play when it comes to highlighting issues of the day. 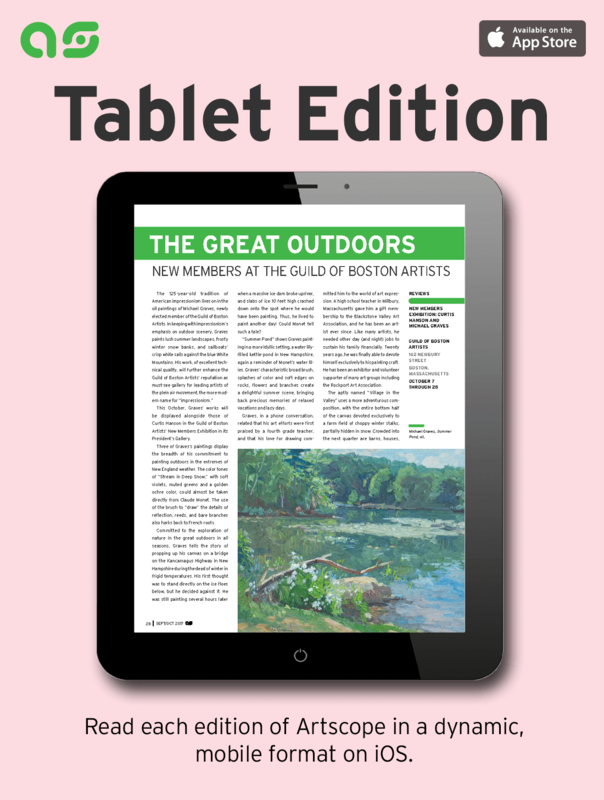 Suzanne Volmer has been keeping a close eye on recent developments in Boston’s SoWa District; her profile of Gallery BOM and its focus on Korean artists is complemented by her profiles on Rhode Island printmaker Elizabeth Goddard and paper artist Barbara Owen. Marguerite Serkin “campaigned” for her profile on Vermont watercolor and oil painter David Rohn, whose work can be seen this spring at the Mitchell•Giddings Gallery in Brattleboro as well as the Next Stage Arts Project in Putney, Vermont. Those craving summer will appreciate Jane Paradise’s “Dune Shacks of Provincetown” series at the Galatea Gallery in March that will, along with Laura Shabott’s profile of her, have you on the phone booking your reservations for this year’s stay on the Cape. If you’re looking for an early spring adventure, consider setting your GPS for Artists Corner & Gallery in West Acton, Mass. after reading Flavia Cigliano’s gallery profile on the venue that recently celebrated its first anniversary. Cigliano talked with owner Margaret Burdine about her decision to leap from her own artistic career as a fiber artist and photographer to overseeing the work of nearly 50 artists while establishing a community gathering spot for classes, workshops and special events. We always aim to have our stories contain a series of “touchpoints.” I asked Ron Fortier, who recently relocated to Portugal from New Bedford, to put together an article explaining how he not only found a new home and transported his supplies with him, but managed to secure new gallery representation overseas while maintaining his existing ones here in New England. This is one for the dreamers among us. 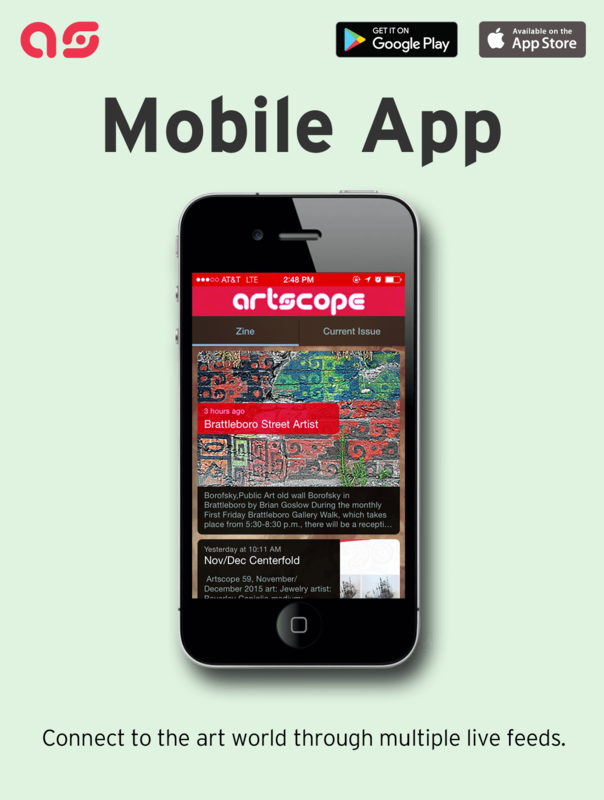 Artscope will be returning as an exhibitor in the Magazines Sector at Art Basel in Basel, Switzerland this June for the third straight year. Over the past year, we’ve expanded our efforts to explore the New England arts community’s place in the wider international market. This issue’s centerfold winner, with an artificial intelligence theme, is Wilda Squires’ “Gold Abstract.” Thanks to our judges: Jo Broderick, dean of college relations and special assistant to the president at Montserrat College of Art; Susan Reid Danton, executive director, Miller White Fine Arts, South Dennis, Mass. ; and Vanessa Boucher, artscope’s media development associate. For our next contest, we’re looking for your best original visionary and outsider art work; full details can be found in our Classifieds section. This is an issue that was built for repeated readings; we hope you’ll explore the works of our “Eleven for Our Eleventh” artists and take in a number of the spotlighted exhibitions. May we cross paths along the way….